The consensus being formed by news media is that the Chicago Police Department (CPD) deserves high praise for how it handled the North-Atlantic Treaty Organization (NATO) summit, especially the protests. 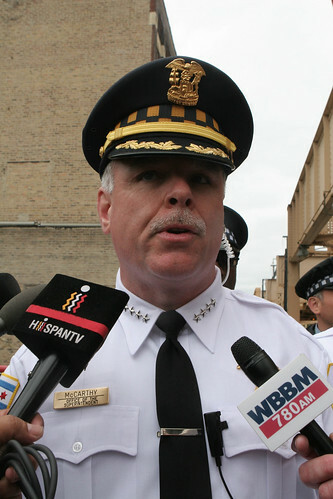 The word is that CPD Chief Garry McCarthy and the thousands of police officers he oversaw exercised great restraint including during the biggest protest against NATO on May 20. The brutality, harassment, intimidation, and preemptive policing carried out by CPD and other security forces has been ignored. And the degree to which Mayor Rahm Emanuel and the city of Chicago engaged in efforts to suppress free speech and assembly ahead of the summit by denying permits and passing restrictive ordinances is all inconsequential to anchors, hosts, or reporters eager to give McCarthy and the Chicago police a stroke job. This reaction ignores the images of police officers clubbing protesters. It ignores the front pages of newspapers in Chicago that showed police clashing with protesters. It dismisses the climate created by the militarization of the city that took place, where security forces were out patrolling the city and targeting people who looked like activists. What really happened was premeditated. The city of Chicago, in cooperation with the federal government, created a climate of repression ahead of and during the NATO summit that went well beyond any planned use of force by police at protests. Andy Thayer, a lead organizer for the Coalition Against NATO/G8 (CANG8), questions all the praise the Chicago police and the city is getting. He is part of a group that worked for months to secure permits for one of two permitted protest events that occurred during the summit. He notes the news has mostly overlooked the fact that the police “kettled” the march and only after that was there any “discernible amount” of violence. People were not able to go south, people were not able to go north and people, shortly after the end of the ceremony, weren’t able to go west either. The police created a “cul-de-sac” in violation of the protest organizers’ letter of understanding or agreement with the city. Police “started pushing into us” and “it was only after they started pushing into us that I saw people throwing things.” Elizabeth, a livestreamer was on the scene with NATO Indymedia, reports they pushed people who had their hands up and started shouting, “Move! Move! Move!” They used police shields to push back the crowd.